Bring a non-perishable food item for a chance to win door prizes! We’ll be collecting non-perishable food items for to help the Council of Churches restock their dwindling food bank supplies. The Council of Churches works together to provide three “no obligation” meals a day at locations throughout Lancaster City and this is the time of year they struggle to keep their pantries stocked with the amount of food they need to do so. Their important work literally feeds hundreds of people each day, with no strings attached, and we are happy to support their efforts. Please RSVP by calling Moira at 717.291.4688 or visit www.historic-restorations.com/circus. 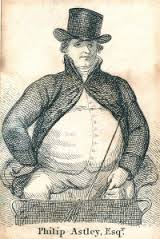 The father of the modern circus was Philip Astley. In the mid-1700’s he performed “feats of horsemanship” in a circular arena he called a “ring”. Not only did the circular shape help the audience to see him at all times, it also generated the centrifugal force Astley needed to keep his balance while standing on the back of his galloping horses. In 1770 he decided he needed more novelty in his performances and added acrobats, rope-dancers, jugglers, and a clown. And so the modern circus was born. Abandoned Vermont: Enosburg Falls Factory The former Dr. B. J. Kendall Company factory sits boarded up and neglected on Vermont Route 105 in Enosburg Falls, Vermont. Enosburg Falls was put on the map when Dr. B. J. Kendall began manufacturing Kendall’s Spavin Cure in 1879. Spavin is a disease that occurs in livestock – a type of osteoarthritis that causes lameness. Dr. Kendall’s business......Continue reading Coffee in Enosburg Falls, VT Who needs a cup of coffee? That’s rhetorical. Aside from needing coffee, I love a good strong cup of coffee in the morning, or most anytime of day. And I love local businesses that serve good, local coffee brewed just right. Those are the businesses that care about their customers. One of my favorite places to get a cup of coffee in......Continue reading Preservation ABCs: V is for Viewshed Preservation ABCs is a series that will work its way from A to Z, bringing words into conversation that are relevant to historic preservation, whether it’s an idea, feature or vocabulary term. The idea is to help you see preservation everywhere you look and wherever you go......Continue reading Fort Popham, Maine Fort Popham in Phippsburg, Maine is a coastal defense battery on the Kennebuc River in Phippsburg, Maine. Construction on this semi-circular granite block fort began in 1861 (for the Civil War) and stopped in 1869, never to be completed. The fort was garrisoned again during the Spanish-American War and World War I, though eventually became obsolete with the construction of nearby Fort Baldwin......Continue reading Shelburne Museum Concerts on the Green As mentioned yesterday, summer is not over. It sticks around for a good three weeks in September. So let’s keep talking summer. What has been your favorite part of summer? The longer daylight hours, barbecues, farmers markets, outdoor concerts, swimming, sunshine, not wearing 10s of layers of clothing, cold drinks, better moods......Continue reading Godey's Lady's Book was a United States magazine published in Philadelphia from 1830-1878. At the height of its popularity in the 1860’s, Godey’s referred to itself as the “Queen of Monthlies”. Marketed specifically to women, each issue contained poetry, articles, recipes, sheet music for the piano, dress patterns, illustrated fashion styles, and other engravings. At $3 per year, a subscription to Godey’s was expensive. Despite this, Godey’s was the most popular journal of its time. The magazine is best known for the hand-tinted fashion plate that appeared at the start of each issue, which provide a record of the progression of women's dress. Publisher Louis Godey boasted that in 1859, it cost $105,200 to produce the Lady's Book, with the coloring of the fashion-plates costing $8,000. Although it was a “Lady’s Book”, it was not a particularly feminist publication. There were special issues that included only work done by women, and beginning in 1852 a regular “Employment for Women” section made its debut - but in general, Godey disliked political or controversial topics in his magazine and stayed away from any potential conflict. So much so that when the Civil War split the nation in half, Godey explicitly forbade the magazine from taking any position on the issue of slavery and so the issues of Godey’s Lady Book published in the runup to the Civil War and even during the Civil war make absolutely no acknowledgement of the Civil War at all. In 1845 Godey’s Lady Book became the first copyrighted publication in America. Louis Godey was widely criticized for this move, with other editors accusing him of taking a “narrowly selfish course”. Hi! I'm Penelope and I'm new around here, but my Mommy and Daddy know a lot about historic preservation and have been teaching me new things every day. Historic wood windows are one of the most "at risk" features of our historic homes. Now, I'm still learning words, but "at risk" sounds pretty bad to me. And apparently it's all because the replacement window industry wants us to believe their plastic windows are better than wood windows. But my Mommy and Daddy tell me it isn't true. They say wood windows not only look better in old houses, they don't cause the moisture issues replacement windows do, AND they are more energy efficient. They told me the guidelines for the best way to take care of America's historic buildings say you should preserve and maintain your wood windows instead of replacing them. And Mommy and Daddy don't usually lie to me. Now I have a secret to tell you, but you have to promise not to tell my Mommy and Daddy... They gave me a report I was supposed to read so I could tell you more about this, but I was too pooped from spending the day at the office and I fell asleep before I finished it. 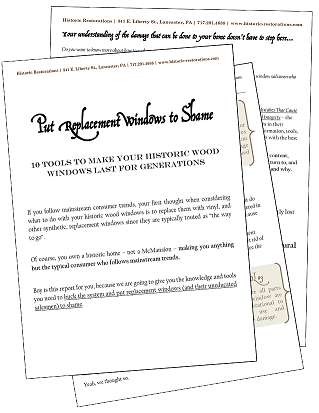 Mainstream consumer trends would have you believe that you should replace your historic wood windows with vinyl, or other synthetic replacement windows. Of course, you own a historic home - not a McMansion - making you anything but the typical consumer who follows mainstream trends. Boy is this report for you, because in it we are going to give you the knowledge and tools you need to buck the system and put replacement windows (and their uneducated salesmen) to shame. To get your copy of the report, call or email Moira at 717.291.4688 or mkarahalis@practicalpreservationservices.com. We ended our summer here at Historic Restorations with a bang…our Preservation Circus in late August.We really enjoyed hosting it and all our guests raved about how much they enjoyed being there for it, so we’re calling it a huge hit. Penelope’s “reviewing” it from her perspective in her column this month (and we hear she took lots of pictures). This month we are highlighting the recent testing our windows underwent to see whether or not they met the LEED standards that a project we’re currently working on required we meet. The results shocked us and weren’t at all what we expected. So keep watch for them in upcoming posts! While you’re waiting, grab yourself a pumpkin spice latte, a piece of pumpkin pie or pumpkin bread, or whatever pumpkin flavored food it is you enjoy this time of year and celebrate the arrival of fall with me! As always,if you have any questions or need anything just let me know. PS: DONT MISS OUR NEXT BIG HAPPENING! tips on planning your project from the comfort of home! 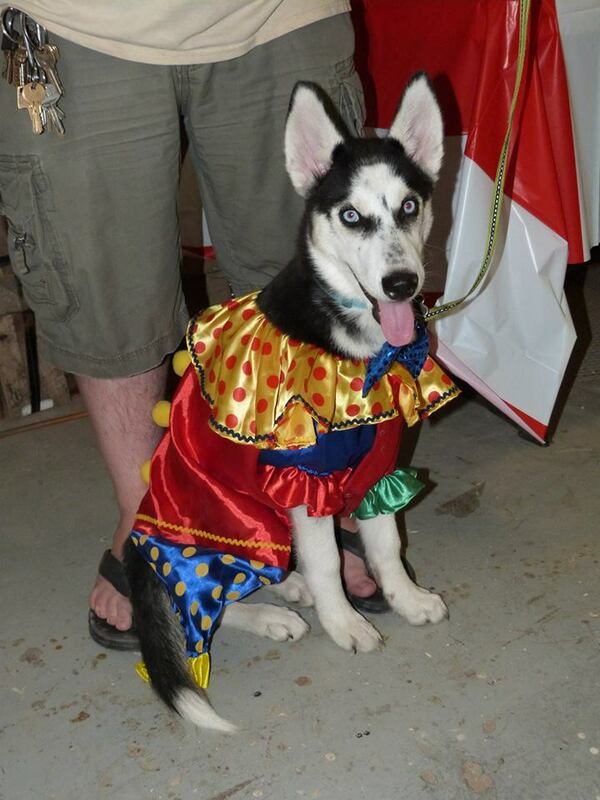 Penelope's Preservation Pointers: Our Preservation Circus! I’m still so excited from our Preservation Circus that I can hardly sit still. There were so many people and Mommy tells me I was the star of the show! It was so much fun… there were tons of people, good music that kept my tail wagging, kids running around, and these cute popcorn cupcakes my Mommy wouldn’t let me eat. Grandpa made his amazing BBQ (don’t tell Daddy but I had some too), which everybody loved. Although my Aunt Layla sneaked too many hot dogs and ended up with an upset stomach. I heard Grandma say we collected 50lbs of food for the food bank!!! Mommy gave lots of tours of the shop and Daddy answered lots of questions about historic preservation (I helped when he got stuck). And the kids ate lots of popcorn. 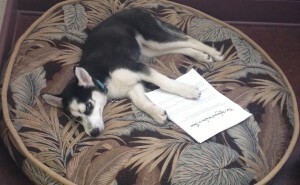 I was going to post all the pictures here, but after uploading them to our Facebook page I’m pooped! So I’m going to just send you over there to look at them so I can take a nap. The fire station in Wallingford, Vermont is located in a the former train station, which is still located adjacent to the tracks. It’s quite the unique adaptive reuse. Take a look (those photographs were night shots, hence the blurry quality). Preservation Solution? Reversible Exterior Window Shades? PA Architecture Traditional buildings reflect the strong cultural ties of the state’s early settlers form the German (Deutsch) speaking areas of central Europe. These Deutsch speakers, came to be described as the “Pennsylvania Dutch” —a rather misleading name based on the mispronunciation of “Deutsch” as “Dutch.” This Germanic influence is most apparent in the southeast section of the state where German settlement began in the early 1700s. While the German settlement later extended throughout the state, this southeastern area retains the earliest and the highest concentration of the early Pennsylvania German Traditional buildings. Buildings in this category take several easily recognized forms. The earliest PA German Traditional buildings were of log or stone construction and of distinctly medieval form with steep roofs, thick walls and small, irregularly spaced windows. These small early houses had floor plans which followed traditional layouts—some very simple one-room buildings, but more frequently a 2 or 3 room layout with a central chimney and corner “winder stair” leading up to a loft or second floor. The 3 room format called for a large kitchen or “kuche” on one side of the center chimney and two smaller rooms including a parlor or “stube,” and a bedroom or “kammer” on the other. This three room Germanic folk house is sometimes referred to as a “Continental Plan” by architectural historians. The two room format known as the “Hall and Parlor Plan” had only a kitchen (hall) and a parlor with a central chimney wall in between. In the vernacular tradition some early stone houses were built over a spring to provide running water and a cool area for food storage in the basement. Some houses were also built into a bank or hillside, partially underground for similar cold storage reasons, as well as cost and material efficiency. This bank style of construction is attributed to medieval Swiss tradition, so buildings opf this type are sometimes called “Swiss style.” Many banked houses were later expanded to become 2 or 3 stories with the ground floor then used only as a kitchen or for storage.Some early houses on the expanding frontier of Pennsylvania were constructed as fortified houses with extra thick walls and small windows to withstand Indian attack. Fort Zeller built in 1745 near Newmanstown, Lebanon County was not actually a fort but such a fortified (thick walled) house built in this manner. Another traditional early house form was the combination house and barn where both shared a common roof. Few examples remain, since it was a more of a short term pioneering practice than a desired housing type. Certainly, for early settlers faced with the need to provide prompt shelter for both the family and livestock such a solution would have been expedient. As family fortunes improved, additional buildings were constructed to separate the farm animals from the family. The buildings of the Ephrata Cloister in Lancaster County are unique surviving examples of medieval German building practices. The Cloister was begun in 1732 as a religious community for mystical German Pietists led by Conral Beissel and drawn to Pennsylvania for its religious tolerance. Ephrata Cloister has one of the best preserved collections of 18th century German vernacular domestic and religous buildings. At its peak in 1750 the Cloister complex included a chapel, mens and womens dormitories, a variety of mills, a bake house, a pottery, cabins, barns and stables. The celibate community declined after the Revolution and became part of the 7th Day German Baptist Church in 1814. Much of the complex remaineds today and is operated as a historic site by the PHMC. Significant buildings include the 1740 chapel called the Saal, a half-timbered, 5-story, clapboard building with shake shingles and small attached stone kitchen and the 1742 sisters house known as the Saron, a steep-roofed, 4-story, log house covered with clapboards containing floors of narrow sleeping cells. The small, unevenly placed, casement windows, steep gable roofs, shed dormers, plain white plastered interior, winding stairs, and center chimneys are all indicative of medieval German building traditions. Some 18th and early 19th German Traditional houses incorporated the customary German floor plan into a more formally designed exterior, adopting some of the elements of the contermporary Georgian style. These German influenced houses usually had four bays, rather than the usual five of the Georgian style and lacked the Georgian center hall as well. The Cooke House in York County and the Christian Stauffer House of Lancaster County are good examples of this blend of Germanic form with Georgian proportions. One of the most interesting and intriguing types of PA German Traditional houses is the Four over Four or Pennsylvania German Two Door Farmhouse. These houses are easily identified by their two front doors, placed side by side in the center of the house with a window flanking each and four windows on the second floor. Houses of this type usually date from the mid-1800s and are often built of brick or frame. The Green House in York County is a good example of this form. One front door opens directly into the family sitting room, and the other into the more formal parlor. This housing form does not exist in central Europe, and is prevalent only in Pennsylvania and its borders, so it appears to be a style developed here. Much debate of the significance of the double front doors has produced some general consensus that it represents the adaptation of traditional German form to the formal symmetry of the popular Georgian and Federal styles. For some architectural historians the twin front doors represent the development of a more utilitarian floorplan with the elimination of the Georgian/Federal style central hall, while presenting a more formal and symmetrical exterior appearance than the earlier medieval German buildings. These distinctive houses can be seen especially in the southeastern and south central portion of the state, often with a detached one room “summer kitchen” just off the rear elevation. The summer kitchen kept the heat from cooking or washing clothes from the main house during hot weather. We're Throwing a Preservation Circus! 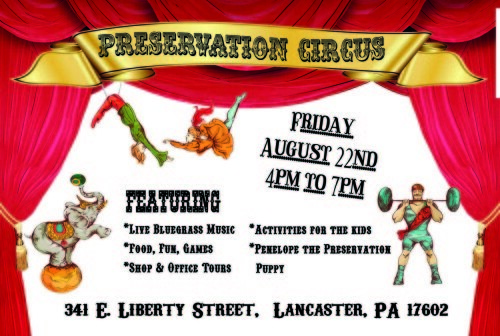 Never ones to do things in a ho-hum way, we’re throwing a Preservation Circus for our client appreciation day on Friday, August 22nd from 4pm to 7pm. Bring a non-perishable food item for a chance to win door prizes! We’ll be collecting non-perishable food items for to help the Council of Churches restock their dwindling food bank supplies. The Council of Churches works together to provide three “no obligation” meals a day at locations throughout Lancaster City and this is the time of year they struggle to keep their pantries stocked with the amount of food they need to do so. Their important work literally feeds hundreds of people each day, with no strings attached, and we are happy to support their efforts. Please RSVP by calling Moira at 717.291.4688 or visit www.historic-restorations.com/circus. Godey's Lady's Book: Early 1800's "Queen of Monthlies"
Godey’s Lady’s Book was a United States magazine published in Philadelphia from 1830-1878. At the height of its popularity in the 1860’s, Godey’s referred to itself as the “Queen of Monthlies”. Marketed specifically to women, each issue contained poetry, articles, recipes, sheet music for the piano, dress patterns, illustrated fashion styles, and other engravings. At $3 per year, a subscription to Godey’s was expensive. Despite this, Godey’s was the most popular journal of its time. The magazine is best known for the hand-tinted fashion plate that appeared at the start of each issue, which provide a record of the progression of women’s dress. Publisher Louis Godey boasted that in 1859, it cost $105,200 to produce the Lady’s Book, with the coloring of the fashion-plates costing $8,000. Although it was a “Lady’s Book”, it was not a particularly feminist publication. There were special issues that included only work done by women, and beginning in 1852 a regular “Employment for Women” section made its debut – but in general, Godey disliked political or controversial topics in his magazine and stayed away from any potential conflict. So much so that when the Civil War split the nation in half, Godey explicitly forbade the magazine from taking any position on the issue of slavery and so the issues of Godey’s Lady Book published in the runup to the Civil War and even during the Civil war make absolutely no acknowledgement of the Civil War at all. In 1845 Godey’s Lady Book became the first copyrighted publication in America. Louis Godey was widely criticized for this move, with other editors accusing him of taking a “narrowly selfish course”. Hi! I’m Penelope and I’m new around here, but my Mommy and Daddy know a lot about historic preservation and have been teaching me new things every day. Historic wood windows are one of the most “at risk” features of our historic homes. Now, I’m still learning words, but “at risk” sounds pretty bad to me. And apparently it’s all because the replacement window industry wants us to believe their plastic windows are better than wood windows. But my Mommy and Daddy tell me it isn’t true. They say wood windows not only look better in old houses, they don’t cause the moisture issues replacement windows do, AND they are more energy efficient. They told me the guidelines for the best way to take care of America’s historic buildings say you should preserve and maintain your wood windows instead of replacing them. And Mommy and Daddy don’t usually lie to me. Now I have a secret to tell you, but you have to promise not to tell my Mommy and Daddy… They gave me a report I was supposed to read so I could tell you more about this, but I was too pooped from spending the day at the office and I fell asleep before I finished it. 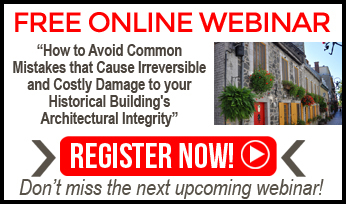 Of course, you own a historic home – not a McMansion – making you anything but the typical consumer who follows mainstream trends.